Beautifully engraved SPECIMEN certificate from the Wisconsin Public Service Corporation. 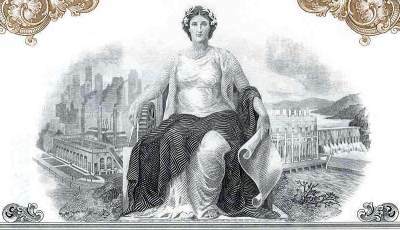 This historic document was printed by the Security-Columbian Banknote Company in 1977 and has an ornate border around it with a vignette of an allegorical woman. This item has the printed signatures of the Company’s President and Secretary and is over 25 years old. 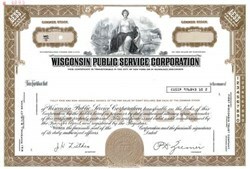 Wisconsin Public Service Corporation is a regulated electric and natural gas utility that operates in an 11,000-square-mile area of northeastern and central Wisconsin and an adjacent portion of Michigan's Upper Peninsula. Serves 442,419 electric and 289,133 natural gas customers. Provides electric and natural gas products and services to residential, farm, commercial, and industrial customers. Also provides electric power to wholesale customers. The WPS Resources financial information pages display consolidated reports for the holding company and its subsidiaries. Electric operations accounted for 69% and gas operations accounted for 31% of 2000 revenues. Electric revenues are comprised of 89% retail sales and 11% wholesale sales. Electric generating capacity based on 2000 summer capacity was 1,957 megawatts, including share of jointly-owned facilities. Electric property includes 20,038 miles of electric distribution lines. On January 1, 2001, 1,563 miles of electric transmission lines were transferred to American Transmission Company LLC in exchange for an equity interest. Gas property includes 5,454 miles of gas main and 66 gate and city regulator stations.